Caitlin Flanagan Loves Jordan Peterson. As Is To Be Expected. Remember Caitlin Flanagan? If not, I wrote about her anti-feminism a long time ago, more than once. Now she has come out in praise of Jordan Peterson, the new prophet which many conservative men follow. If you are not familiar with Peterson's work, you can get a crash course right on this blog*! That might seem like a small thing, but it’s not. With identity politics off the table, it was possible to talk about all kinds of things—religion, philosophy, history, myth—in a different way. They could have a direct experience with ideas, not one mediated by ideology. I have read (and reviewed) Peterson's little book, and one thing it is certainly mediated by is ideology: The name of the book is 12 Rules For Life. An Antidote to Chaos, and Peterson tells us, repeatedly, that chaos is the eternally feminine. He also tells us that patriarchy has existed for the good of us weak, feeble and leaky women, and he has a whole chapter in his book about masculinity in peril. No, Caitlin. No. 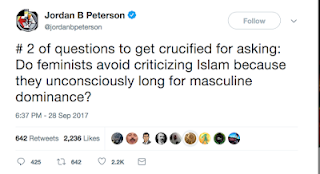 Prophet Peterson is not a non-ideological source ideas (if such a thing even were possible). His ideology is anti-feminist, based on societal hierarchies** and the belief in natural male supremacy. His sources are often based on the nuttier kind of evolutionary psychology, and he is a biological essentialist who believes that women would be much better off at home. * A few useful posts, in order: This one introduces you to Peterson and his debating technique, this one talks about chaos as eternally feminine and order as eternallly masculine, and this one is the first post in my book review of Peterson's book. More right-wing ideas about Peterson are discussed in this post. Of course evolution is much more complicated than just putting some quick equal-sign between lobsters and humans, as this marine biologist points out. And, as an side, this is a good review of Peterson's book, with a title about lobsters. *** Peterson's other views are firmly right-wing, too, with a few small variations. The Alt Right loves him, by the way. Scott's take on other aspects of the Flanagan piece also covers some of this. Short Posts About Women's Issues, 8/10/18. A Japanese medical school deliberately cut women’s entrance test scores for at least a decade, an investigation panel said on Tuesday, calling it a “very serious” instance of discrimination, but school officials denied having known of the manipulations. Prime Minister Shinzo Abe has made a priority of creating a society “where women can shine”, but women in Japan still face an uphill battle in employment and face hurdles returning to work after childbirth, a factor behind a falling birthrate. The alterations were uncovered in an internal investigation of a graft accusation this spring regarding the entrance exam for Tokyo Medical University, sparking protests and anger. Lawyers investigating bribery accusations in the admission of the son of a senior education ministry official said they concluded that his score, and those of several other men, were boosted “unfairly” - by as much as 49 points, in one case. They also concluded that scores were manipulated to give men more points than women and thus hold down the number of women admitted, since school officials felt they were more likely to quit the profession after having children, or for other reasons. Note that last sentence. I have just been reading all those right-wing MRAs and Jordan Peterson types who argue that women really prefer to stay at home with the children. And if they don't, well, Japan has a second solution (other than altering test scores) to that one, too: Make working after having children very difficult for women, due to discrimination against mothers. This cartoon rings such a bell with me. The hat the cartoon stick figure Matti wears is a traditional men's beanie, with associations to Kalevala. Well, I associate it with that and the playing of kantele. Brothers Under The Skin. On ISIS And US Alt Right Movements. 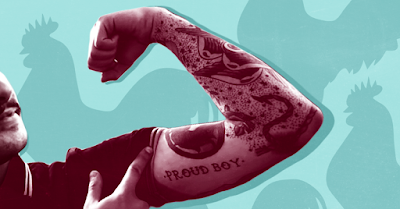 The Proud Boys participated in Saturday's fascist demonstration in Portland Oregon, which made me have another look at the principles of such Alt Right movements as the Proud Boys: Their contempt for women, their adulation of white nationalism/supremacy and their love of physical violence. If I replace the "white nationalism/supremacy" bit in the above sentence with "extremist Islam", that amended sentence would also neatly summarize the principles of ISIS. Both types of movements have strong hate policies and rankings against "outsiders", both movements are willing to use violence, and both movements want to limit women's activity to reproduction, childcare and housekeeping*. The Proud Boys, for example, say that they adulate housewives**. Essentialist or religious arguments about women's proper roles as limited to the home are used in all such movements. The sexes tend to be segregated and men rank higher than women. There are differences, too. ISIS is a much larger movement and one explicitly based on religious tenets, while the various Alt Right movements are either right-wing Christian or secular, and much smaller. Estimates about the number of, say, active Proud Boys hover around six thousand. ISIS has also been far more violent and far more misogynistic in its actions than, say, the Proud Boys movement (perhaps because the latter has not had the power to act out its principles). And in the imaginary global religious warfare the two movements would be on opposite sides.